Today I'm sharing a recipe from the brilliant JUST A TASTE! Kelly's recipes are fantastic and super easy for all those ladies on the go #win ! These 5 - minute brownie waffles are insanely delicious and will no doubt be a new favourite in your home! Preheat and grease your waffle iron with cooking spray. In a bowl, prepare the brownie batter per the box instructions then stir in 1 additional egg. Scoop about 1/3 cup of batter into the waffle iron and close the lid. Serve immediately with whipped cream, strawberries or any other topping you desire! 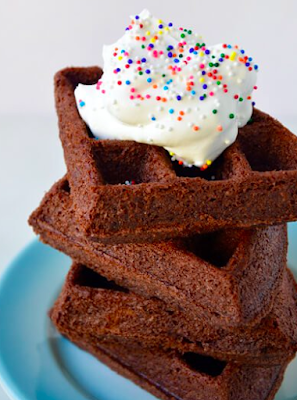 I've wanted a waffle iron forever and this recipe makes me want one even more- yum!